Thanks to Kizmos, I was able to make my daughter smile with this Chocolate Root Beer Float Milkshake! 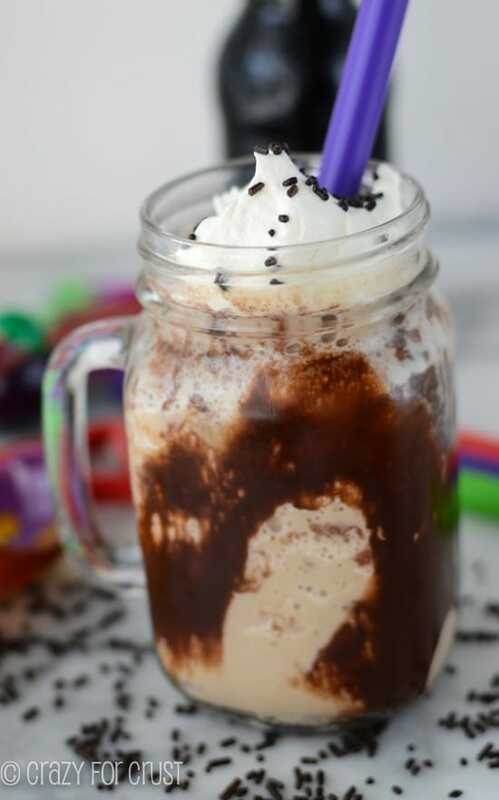 A blended root beer float with a chocolate coated glass is the perfect summer drink! Remember back in the day when A&W Root Beer was its own restaurant? Before they merged with KFC? I’d go there and get a chicken sandwich, plain, with lettuce. Ohmigoodness I can seriously taste that sandwich. My drool sensors just went into overdrive. I’d always get a root beer, and sometimes a root beer float. I love root beer, almost as much as I remember loving those chicken sandwiches. It makes me so sad that some restaurant big-wig owner guy decided to merge KFC and A&W. Now, when I go to A&W, the chicken sandwich is not the A&W sandwich. It’s the KFC one and that is so not even close to the same thing. Root beer floats, however? Are always the same. Now I love me a root beer float, but I often feel gyped. Why? I have no idea. Maybe because the food-blogger in me is saying “it’s just ice cream and root beer” or something? I don’t know. Maybe because when I get a root beer float I end up stirring and stirring and eating the foam and then stirring some more until the ice cream is mixed into the root beer? Then I drink it down like it’s a cream soda, no ice cream involved? Whatever it is, I love root beer floats, but I love melted ice cream root beer drinks more. So when I got my newest Kizmos products and they included an ice cream scoop, bottle opener, and milkshake straws, I kind of knew immediately what I wanted to make: a root beer float…milkshake. I’ve been working with Kizmos all year now. Their fun, smiling products brought you a killer Strawberry Nutella Tart and an out-of-this-world Macadamia Nut Magic Pizza. 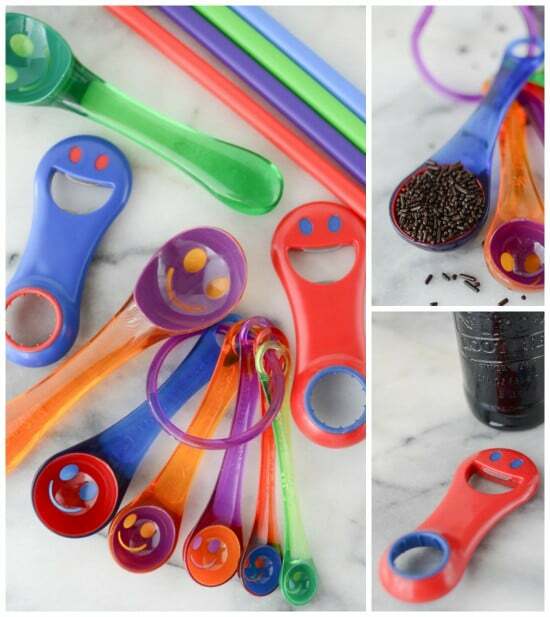 Now, in the heat of the summer (omg, it won’t stop being hot here), the smiling kitchen gadgets are bringing you a root beer milkshake. Have you ever paired chocolate with root beer? Um, wow. Right up there with peanut butter and chocolate, let me tell you. Such an amazing combo! 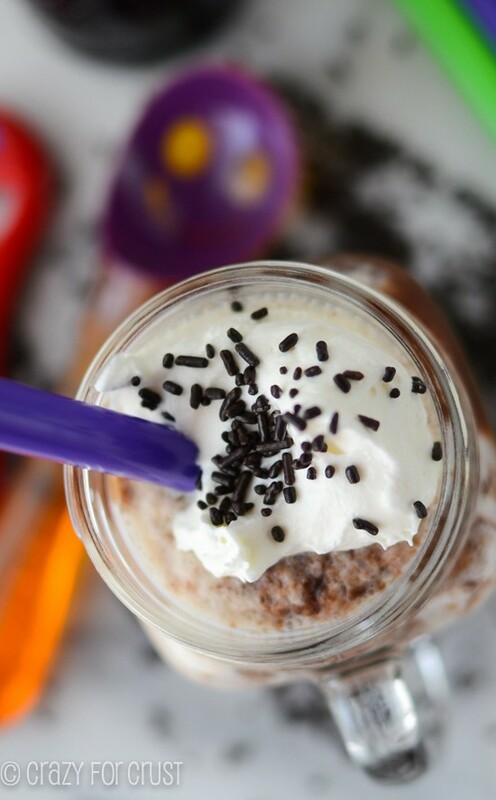 Root beer, vanilla ice cream, and ice get blended in your blender. 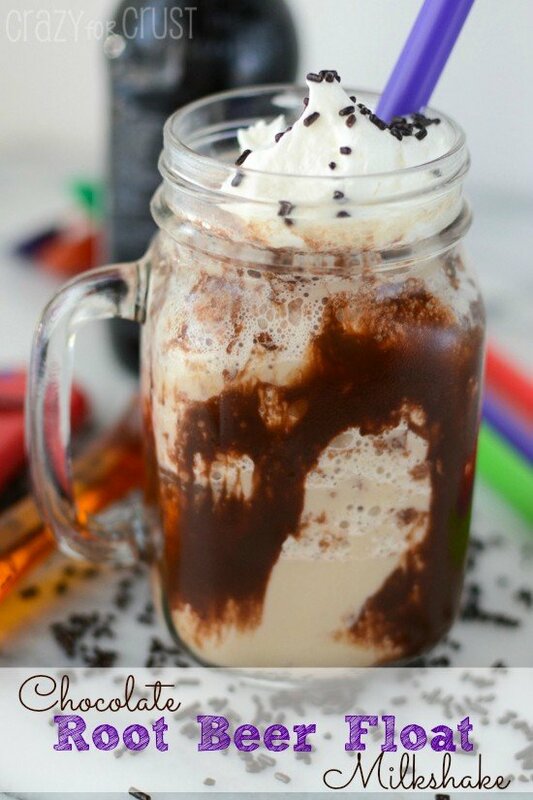 Your pour that lovely combo into a glass that’s been lined with chocolate syrup. Then top it with whipped cream and chocolate sprinkles. Start with cold root beer. Otherwise your ice cream will melt too fast. Make sure your chocolate sauce is also chilled, so it looks prettier on the glass. Or, you can do what I did. Messy it was, but good it was too. If you’re serving to adults, add a little vanilla vodka for a boozy shake! Have an amazing milkshake straw to drink out of! I absolutely love these Kizmos milkshake straws. The hole is super huge, so you can drink a thick milkshake out of them. I also used them with a smoothie that was really thick (I was anticipating it to be a spoon smoothie) but with these straws? No spoon needed! The ice cream scoop is just the right size for a scoop, and the bottle opener. I’m sorry, but there is just something so fun about a bottle opener smiling at you. You can’t help but smile back. This milkshake is so easy, it’s kind of embarrassing. And it’s so good, the recipe makes two, but you’ll pour it into one large mason jar shaped glass (ahem) and say it only serves one. Just sayin’. Make it when no one else is in the room, and you won’t have to share. But I want to share these Kizmos smiles with you. Scroll down for a giveaway! 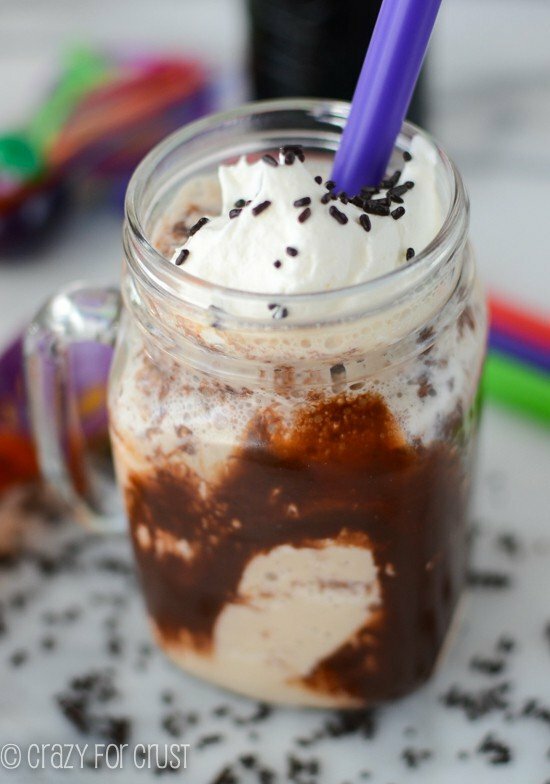 Make your kids smile with this Chocolate Root Beer Float Milkshake! 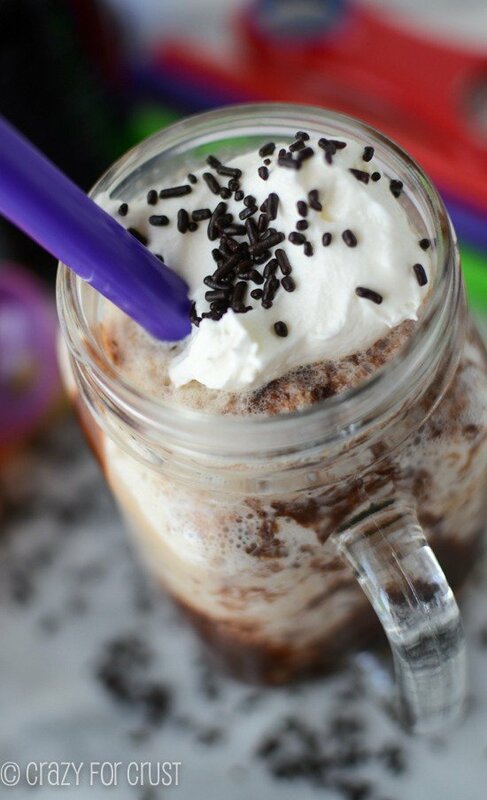 A blended root beer float with a chocolate coated glass is the perfect summer drink! Squeeze chocolate sauce inside your serving glasses. Don’t completely coat the insides, just do a swirl or up and down pattern. Leave some glass showing through. Add root beer and ice cream to blender. Blend until smooth. Add ice, 1 cup at a time, and blend until you get the thickness of shake you desire.